The Funeral service Mr. Ian Kenneth Reed is on Tuesday May 3rd at the Le Pine Chapel 132 Mt. Dandenong Road CROYDON Victoria commencing at 2.30pm. 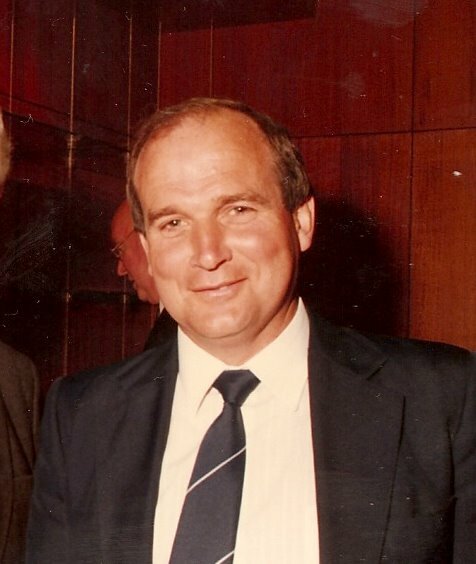 The attached photo is the only one I could find at present and was taken at the 20 year awards in Melbourne office about late 1984 or early 1985. Ian commenced with O.T.C. (A) on the 12.1.1959 as a Traffic Assistant Grade 1. in the M.O.R. then located at 167 Queen Street Melbourne. Ian’s commencing salary at that time was 360 pounds per annum and his education standard on leaving school was the Technical School Intermediate Certificate. Ian was living in East Ringwood and would have travelled by train to Flinders Street Station. Late 1960 O.T.C. moved to 382 Lonsdale Street where Ian progressed through the ranks to I.T.O./S.I.T.O. then transferred to the Commercial/Marketing Branch in Melbourne. Whilst in OTC’s Commercial branch Ian had the opportunity to advance his career and early in the 1970’s Ian & Janet & family moved to O.T.C. Sydney for 2 to 3 years (a big step in those days), then came back to Melbourne as a Senior Commercial officer. Back in the early 1960’s Ian met and married Janet who worked with Judith and I (Robert Hall) in OTC Melbourne accounts branch on the 4th floor. We attended each other’s weddings and Judith and I stayed with Ian & Janet with our families for a week at their home in Sydney in the mid 70’s. Ian was a member of the OTVA and served for a number of years as an Honorary Auditor. In the 60/70’s Ian was active in a number of OTC sporting events organised by the OTC Sports and Social Club, and attended a several Wagga weekends. Ian was very much admired by his work colleagues for his long experience and knowledge of the Telecommunications market. He was a smart business thinker, very aware of commercial issues and customers. Even tempered and rarely rattled by the daily pressures of work life. He treated everyone with respect, from senior managers to junior support staff with the same dignity and amiable style he was renowned for. Over the years Ian remained in contact with work colleagues from his former years in OTC right up until his retirement and was always open to sharing a beer or two at his favourite watering hole. I am very proud to say I was a good friend and work colleague of Ian and our deepest sympathy to Janet, Andrew, Christopher & Elizabeth. He will be deeply missed by us all. As best as I can recall, it was probably during the mid 70’s when Ian & I first came to know one another. We had both emerged from OTC’s operational businesses of the 60’s & 70’s – the somewhat notorious Sydney & Melbourne Operating Rooms & international Telex Exchange at Paddington – to find new & markedly more challenging activities in OTC’s new world Commercial (later Marketing) Branch. In addition to our past operational background, both of us were recently married in those days & had growing young families as a further common link between us. Ian had an easy going, cheery outlook on life that stood him in good stead with his new role within OTC. He made a significant contribution to the Companies sales & marketing activities, especially among customers in Victoria & South Australia during those heady pioneering days when “Maltby’s Marauders” broke new ground. The former ‘engineering focus’ of the company shifted rapidly in favour of the new customer focused organisation under the drive & direction by George Maltby.